Papers, oil, flashe, pencil, MSA gel. Unframed. “Jazz: Thinking Out Loud, Reaching for Song #1-32” is a series of experimental drawings and paintings based on student music from Berklee College of Musicʼs Global Jazz Institute. “Having spent nearly five intense years completing “Jazz: Edward Simonʼs Venezuelan Suite #1-23”, I was eager to break my process open and chew through some new ideas. Experimentation demanded a quicker way of working. I turned to drawing – to me, the thinking-out-loud of visual art.” On National Public Radio, Ellen Priest had often heard the music of newly discovered jazz musicians, especially those from Africa and Latin America, who made their way into the US jazz scene via Berklee College of Music in Boston. What better way to fuel her own improvisation than to listen to music-in-progress? Berkleeʼs Department of Liberal Arts, music faculty and elite Global Jazz Institute welcomed Ellen for a residency in late 2010, and this body of drawings, brush studies and collaged paintings was the result. 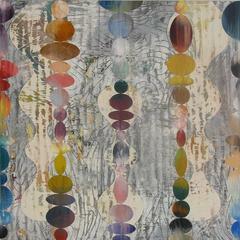 Ellen Priest is an American abstract artist who is inspired by music and most notably by jazz. She lives and works near Philadelphia.